Serving the Roman Catholic community of Redhill and surrounding area St Joseph’s church and school was rebuilt in the late 1980’s and stands on a prestigious site at Ladbroke Road, Redhill. 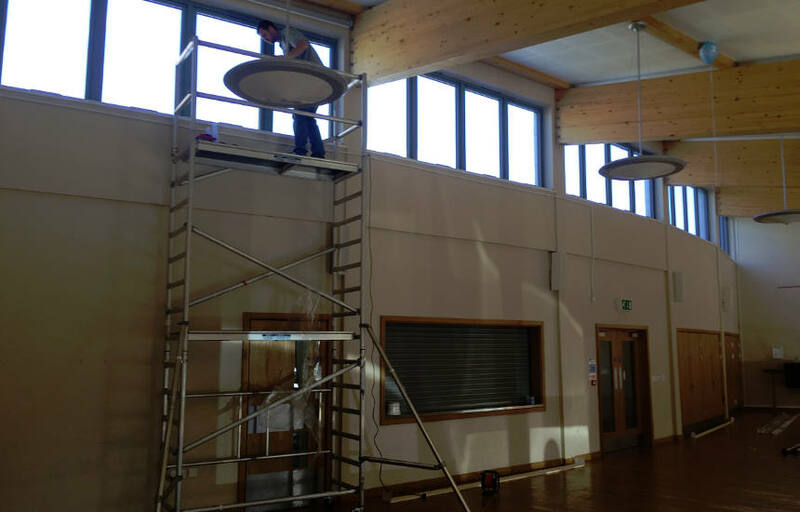 As part of a recent extension the church, bringing them into modern time installed computerised projector screens to allow the area to be used for many additional functions, however to maximise the use, they had a problem with high level windows and direct sunlight. Having invited a few companies to provide a solution they could not find a suitable result, as the windows were almost 4.5 meters wide and 5 meters from the floor. When we were contacted and described the problem they were amazed that we had just the product. Our large Heavy-duty roller blind system can be produced up to 5 meters wide and operates by a simple quiet motor to smoothly open and close the blinds every time they need them. Now they have the perfect balance of light control at the touch of a button.